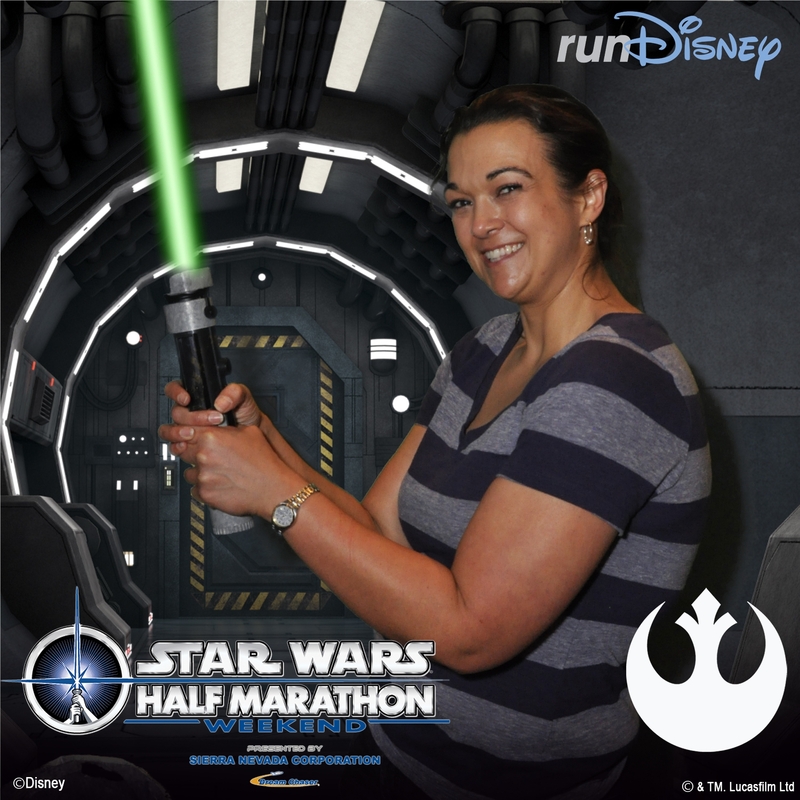 Friday Favorites: Star Wars Rebel Challenge is Here! I was awakened this morning by the sound of runDisney race announcers Rudy and Carissa kicking off the start of the 5K. No matter how much I want and need more sleep, between all of those festivities and the time zone change, it looks like I’m awake for good. I’ll take advantage of it to go cheer on the 5K runners as they finish, which should be fun. Aren’t Mickey and Minnie cute? 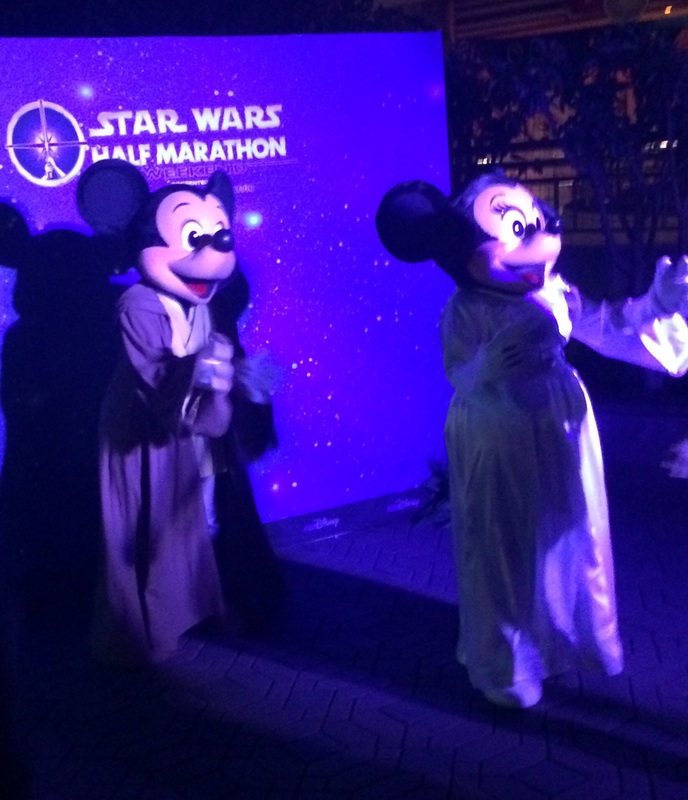 I confess I’m much more likely to try to stop for a picture with these guys than the normal face character Luke and Leia during the race this weekend. I just wanted to pop in to say Hi, share a few pics (be sure to follow along on Instagram – jessanic – and Facebook – Little More Each Day – for more) and remind you guys to enter the Southern Living cookbook giveaway if you haven’t. I’ll be picking a winner next week and entries close on Tuesday! – Check out this awesome Star Wars inspired playlist! I am so tempted to get these songs, especially after hearing the Darth Vader music to wake me up this morning. – I’m sure you’ve seen the “The Girl Can” ad but if you haven’t, be sure to check it out. Anything that highlights the wide range of women’s bodies engaged in healthy activity is a good thing, from the conversations it starts to the people it inspires to get out and try because they’ve seen other people who look like them do it. I’m off to cheer on some 5K finishers. I hope you guys all have a great Friday! The movie, not an actual vacation yet. I’m very excited to go watch Christmas Vacation in our local movie theater with my husband tonight. 🙂 It’s one of my favorite holiday movies and O’s school is doing their annual parents night out tonight, so he’ll be partying with them until 8:30. That means hubby & I get a date night and we couldn’t pass up the opportunity to kick off Christmas with one of our favorite movies! 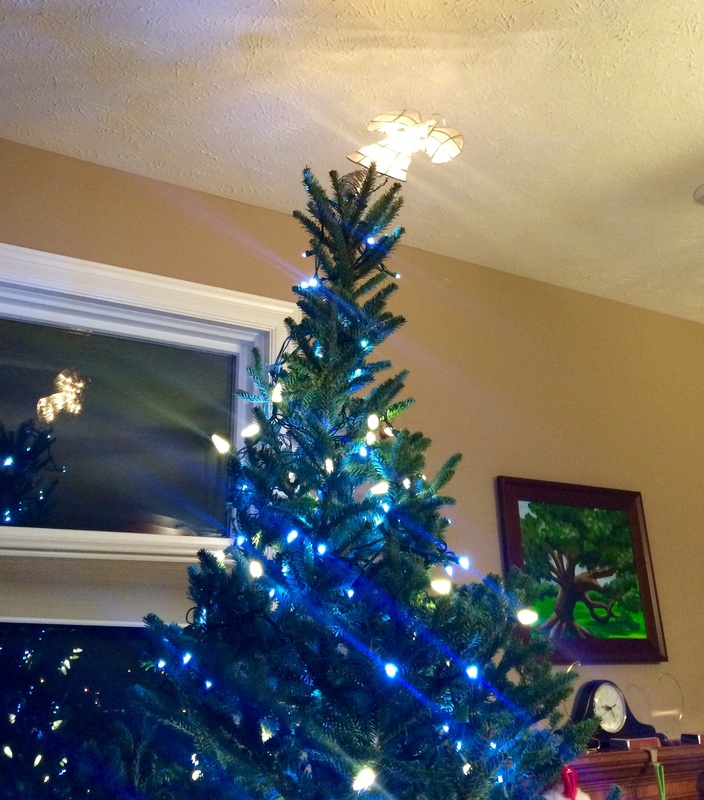 We’ve also put up our tree to kick off the Christmas season but our angel looks a little tipsy up there doesn’t she? One of my favorite things about this week has been embracing my “do a good deed every day” goal. 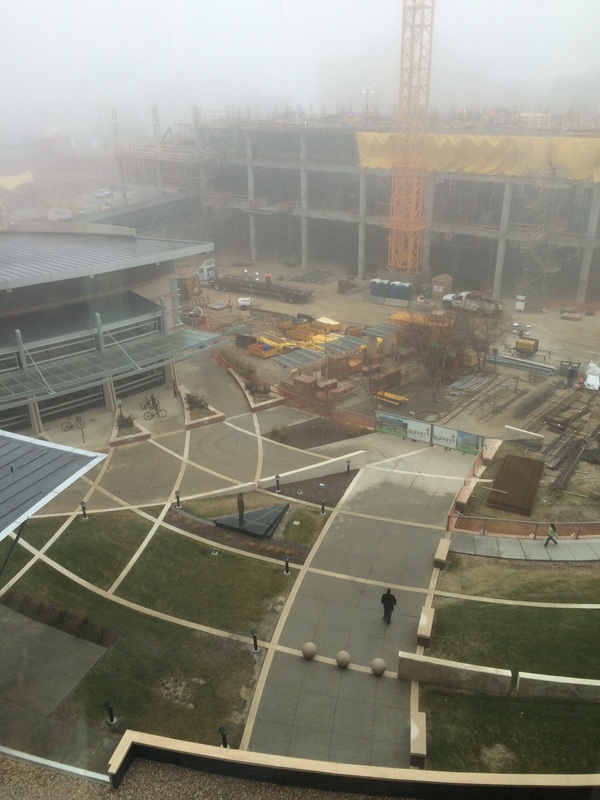 Today, that included helping someone find their way through the maze of construction here to get to the building they needed (which was definitely not the one they were in when I found them). Wednesday, we bought dinner for another family at Village Inn, which is an annual tradition of ours. What I really loved was that the restaurant manager involved Oliver in the process and brought the table map of the restaurant over so he could choose the table. They’ve watched him grow up and know us enough to know that we’re trying to teach him the importance of giving back and being grateful for how fortunate we are as a family, so I love that they helped us involve him in this little endeavor. We’ll buy dinner for someone every week this month, which is always fun. It’s getting harder and harder for people to navigate here on campus! On to some of my favorite posts of the week! Christine runs a series called Ask a Yogini, which I love because it merges her running interests with her expertise as a yoga instructor. This week’s post discussed the benefits of yoga for runners and I particularly liked how she highlighted things beyond the stretching and strength benefits (undeniable, of course) to include things like breathing and mental training. The mental training is so huge for me because I feel like in so many ways my brain konks out in races. Check it out here. Runner’s health has a nice review of a recent article about exercising and weight loss, including the sometimes contradictory issues with regards to increased appetite or even weight gain when we’re trying to lose weight. The blog recap is here and the link to the original research article is here. As a science geek, I found the discussion of how hormones affect appetite particularly interesting (and I confess, as I’m feeling hormonal swings more now with an IUD than I did on the pill, I noticed some appetite shifts this week). Heading into the holidays and feeling a little frustrated that the weight gain I told you about earlier this week is still hanging on (yes, I’m getting on the scale every morning even though I know better – GRRR), Dani’s post over on Weight off my Shoulders really resonated with me. It always helps to know that others have these struggles too and the reminder to pull out my Reasons to Lose and Reasons to Maintain lists again was a good one. Maybe I need to re-evaluate those this month to remind myself why I’m doing this! Lastly, I have to share this news story because it was such a bright spot in an increasingly depressing news cycle we’ve got going in the US lately. There’s a football player in Houston, Andre Johnson, that does a shopping spree for kids every year and it just made me smile to see these kids’ pictures. We can all share the joy in big and little ways this holiday season. I hope someone shares it with you and you’re able to pass it on! What’s your favorite holiday movie? I love so many, but Christmas Vacation is definitely near the top of my list for nostalgia reasons. Friday Favorites: Thank goodness it’s Friday! I am so glad it’s Friday. This has felt like a REALLY long week. I had a migraine that woke me up in the middle of the night late Sunday/early Monday and starting my week off groggy, nauseous and tired made for a bad start to things. I am so glad I don’t get many migraines and have immense sympathy for those who experience them often. Thankfully, things are getting back to normal. On to happier thoughts! First up, in my August goal of a good deed every week, I picked “Donate to a charity that benefits animals or children” from my lovely little book of good deeds. A few months ago I came across Project Nightlight and thought it sounded wonderful. This charity provides a security blanket, a stuffed animal and a book for children who are come into homeless shelters. For children with so little and at such a hard moment in their little lives, this small bit of grace and kindness seems so lovely. You can donate money (the route I’m taking today) or work with a local shelter to build your own kits to donate, which I think we’ll do with O in the future. We are so blessed, so I definitely want to help him learn to appreciate how what we have and to help those who aren’t as fortunate. SparkPeople is a free website with loads of fitness and nutrition information. There are fitness, weight and food trackers you can use, as well as message boards and blogs. Even though I don’t use their trackers, I love getting the emails with links to their articles because they frequently do a great job discussion rational, real life approaches to diet and exercise questions. This week, I got sent the link to this article “The truth about the paleo diet” and I highly encourage reading it, whether you’re interested in paleo or not. They do a nice job discussing the inherent limitations of most published research on dietary programs as well discussing specifics of the paleo diet. The bottom line is really to eat food that makes you feel good and try to eat more “real” food than anything else, without worrying so much about what name we put on things. On another food note, this Grocery Guide for Runners from Runner’s World is really handy, particularly if you’re trying to figure out how to get started with a healthier diet to support your running. You’d go bankrupt trying to buy everything on this list, but start with a few healthy swaps and build on as you find things you enjoy. Emmie, as she so often does, found a way to articulate things I thought lingered in only my own head this week with her post about her confidence bucket list. I’ve talked before about tackling a rock wall because I was afraid to do it when I was heavier (here) and other things I didn’t do because I didn’t have enough self-confidence to tackle them. #1 on Emmie’s list, look up in a crowd, especially spoke to me. I felt the need to try to shrink from notice for so long when I was heavier and thought that when I lost the weight, that urge would go away. It turns out, the urge to hide had less to do with my size and more to do with my feelings of self-worth and I clearly still have a lot of work to do in that regard. There a great list of blog writing prompts for August over at BrittanyHerself.com that are focused on body image and self love that I may need to spend some time reflecting on this month. – I tackled a run I didn’t really feel up to last night and spent some time hanging up with my feet up the wall in one of my favorite restorative yoga poses afterwards (another goal for the month). My lovely husband didn’t believe me that it was restful and felt really good, so he hopped down to try it himself. How can you not smile? The blob on the right is me, the blob on the left is Darrell and the monster is apparently behind the paper chasing us (per O’s rather matter of fact description of the drawing for us). The only one remotely like that. I’m sort of disturbed and more than a little proud of his imagination. I can’t believe I’m already one month into the new training plan! So far, I am definitely enjoying the challenge of this plan. 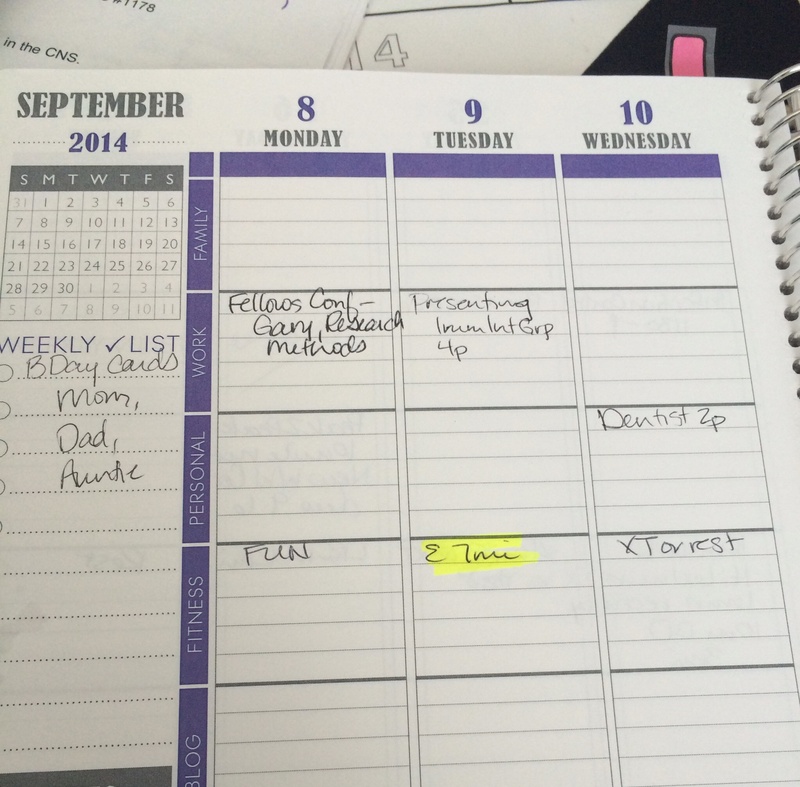 This weekend, I looked back at my goals for this training plan to see how I was doing so far. – Do the workouts in the order prescribed: For the most part, I’ve done the workouts on the days designated in the plan and I have to say I LOVE IT. I love not getting to the end of the week panicked about what workouts I still need to get done. I just find a way to get it in on the day it is prescribed. It helps that every Sunday we get an email from the lovely Another Mother Runner ladies that goes through the week’s workouts, with a little discussion of what is different or particularly important for the week. Today, I have 5 miles on the schedule. It’s nice not to wonder about what kind of workout I’m doing and I definitely appreciate the separation between the hard workouts. Coach Christine Hinton, who designed the plan, is available via the Strava message boards to help if you have to rearrange your workouts in a particular week and has specifically addressed that issue in the newsletter, which is really helpful. – Do the strength training: I’m not doing as well with this as I’d like, but I am at least getting it in once a week and I’ve noticed a definite difference in my push ups and planks, as well as my coordination with the leg work. My goal for month two is to get better at getting the strength workouts in! It definitely helps when my boys join in. There’s nothing like your 3 year old saying “time for push ups Mama” to get you going. 🙂 This month, they sent out a pilates inspired workout that looks fun and tough. I’ll test it out this week and report back. – Incorporate yoga/stretching/foam rolling every day: While I’m not doing it every day, I am at least doing some stretching after every run. I need to get more regular with this, like I mentioned in yesterday’s August goals post. One of my goals for August is to do yoga once a week to supplement the mini yoga moves every day. It feels so good and is absolutely worth 5 minutes a day and 30 minutes a week to protect my hard working legs! – Take the cross training option when I feel like it: I’ve really embraced this, given the higher mileage called for in this plan, and I think that’s protected me from a lot of aches and pains I’d otherwise have by this point (especially with my half-hearted yoga/foam rolling). Most of the days the plan offers a non-running option, I’ve taken it, which means I only actually HAVE to run three days a week with this plan on most weeks (Tuesday 5-7 mile easy run, Thursday hill or speed work and Saturday long run so far). As the plan picks up, there will be more running days but I think taking this route has helped me ease into a relatively high mileage and intense plan (for me at least). Hiking Montana was a gorgeous but tough workout – yay for cross training! I was worried about the added mileage in this plan and about the speed and hill work. It turns out, I love the speed work and hill work! Such a quick, tough workout that makes me feel like I really earned that sweat! So far I’ve done well with getting those Tuesday long runs done in one chunk in the morning, although I forgive myself in advance if I have occasionally have to break in two. I mentioned earlier this month how interesting it was to already be at 8 mile long runs on week 3/15 instead of near the end of my previous training plan. I was nervous about that, but now it is a real confidence boost to know that I’m more than capable of that and that my long run pace is very near where I was at the end of my last training cycle (between 11-11:30 minute miles). With almost 3 more months of training and cooler weather in the last month or so of that training, I can’t wait to see how much more those paces improve! In this week’s newsletter, they talked about the plan design intentionally including multiple repeats of higher mileage runs like the long runs because it gives you lots of time to adapt mentally and physiologically to those runs instead of it just being a one time thing. I think it will definitely pay off in terms of mental confidence, knowing when I line up on race morning that I’ve been running 10+ miles as my long run four times before race day! Overall, I’m loving this plan so far and looking forward to the challenges the next month brings (including a long run on 8/23 with the last 10 minutes as a “strong finish”). I’m going to work on incorporating more strength work and yoga. I’m also going to do a timed mile this month and each month going forward, like I mentioned yesterday, just to have some concrete measurement of my progress. Forward march (or run, as the case may be)! Is it just me or did July go by in the blink of an eye? Wow! That means it is time to look back at my July goals and see how things went. In a nutshell, things went fairly well. Run a 10K on my birthday Done! And with a bigger PR than I expected, particularly impressive given my difficulties with the gravel road. Register for the National Weight Loss Control Registry Done! Or at least requested. They only send out the packets every two months. I’ll be sure to let you guys know about it once it gets here. Commit to Simply Filling for One Month I’ll go into more detail about this on Wednesday, but overall it has been a good thing, served the purposes I wanted and I still fit in my pants. Wins all around right? Make a doctor’s appointment Done! I’ll get a check up later this month, complete with all of the scary blood work. Yoga Not so great with this one, despite feeling SO much better when I did get around to it. I have done the deep squat after most of my runs and it feels so good, even if it does look awkward. This one goes back on the list for August, so hopefully I can get more consistent with it. Yoga Sticking this one back on here, specifically with a plan to devote one day a week to an actual yoga workout as well as the three little stretches from last month’s list. Decreasing artificial sweeteners One thing I’ve noticed since switching to Simply Filling is that I eat a lot less fake food now. It’s rare that I have anything artificial during the day other than my beloved Splenda. Looking at this made me realize that I go through a lot of Splenda and while I think that’s okay, it’s probably also okay to look at easing it back a bit. Thus, I’m setting a goal of decreasing the Splenda in my coffee and my oatmeal (the two places I use it most often) by one third by the end of the month. I can ease it back a bit at a time to get my taste buds used to it. Lifetime Fitness 10K a Day Challenge My gym is sponsoring a 10 thousand step-a-day challenge August 6 – September 5 and I got registered. My virtual walking path will be some sort of viking trail. 🙂 It seemed like a great way to keep moving on my non-running days! Good Deed A Day (or a week rather) I got this cute little diary for doing a good deed every day back at Christmas. I’m coming into a particular crazy couple of months work-wise, so to help me keep some perspective and balance, I thought it was the perfect time to break out this little book and follow the tips within. There are suggested good deeds and you get to write about the ones you perform. We all know how much I like writing about things, right? Because things are so busy, it’ll be a good deed a week approach, but still one I’m looking forward to! I’ll update you guys on Fridays as I get started. Run a “Magic Mile” I want to know how fast I can run a mile. With the Jeff Galloway training plans, you do the Magic Mile periodically, where you warm up and then run a mile as quickly as you can, throughout the course of your training plan. It would be fun to see the kind of progress you can make over the course of a training cycle! Thus, one day this month, I’ll do a test mile and let you know how it works out. Throughout all of this, of course, I’ll be keeping up my half marathon training plan and I’ll update you guys tomorrow with how that’s going so far. 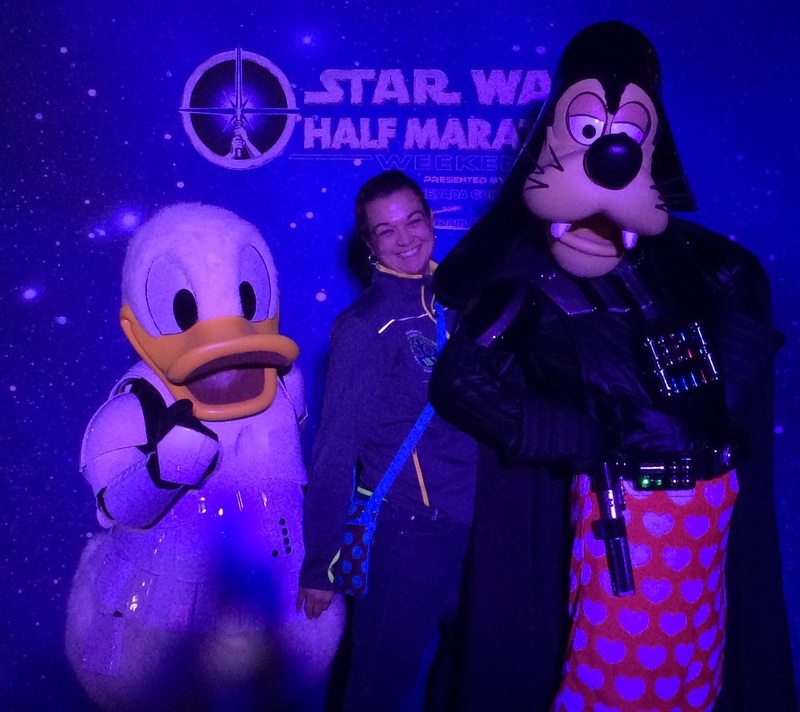 I finally updated my training plan on that page of the blog! 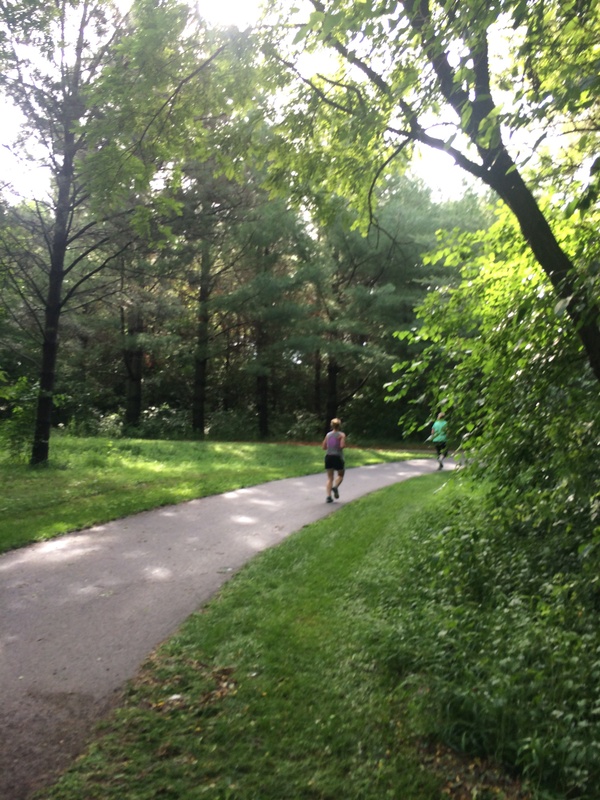 Weekly Wrap Up: Cooler weather means faster runs! Monday 45 minutes walking at the mall while my oil was being changed, plus 20 minutes of gardening with O when we got home. The training plan called for a “fun” workout but after the dustup at school with O Monday afternoon, I couldn’t get my mind around a truly “fun” workout and just called things good enough with my mall laps. Tuesday 7 miles in the morning, complete with mostly negative splits and a truly fantastic feeling run! I was so worried about getting in so many miles on a work day, so I am really proud of myself for getting up early enough to get this done. The weather was simply gorgeous and cool, which helped tremendously! My overall pace was 11:20, which was great for such an early morning run. 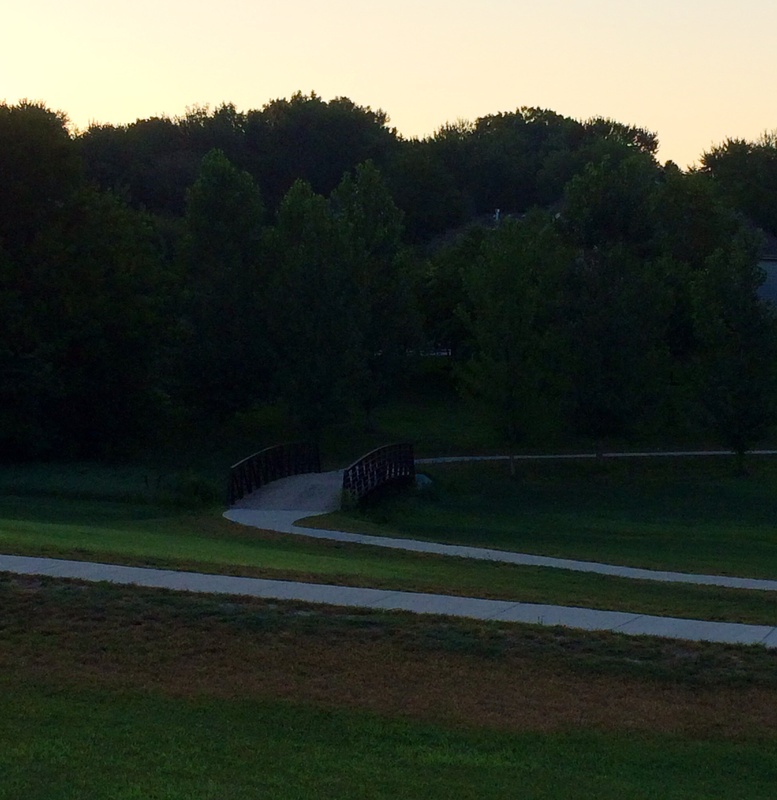 Spying a cute little bridge in the early morning light brought a smile to my face on my Tuesday AM run. Wednesday Cross training or rest on the training schedule, so I took a rest day after that long Tuesday run! Truly, things were just crazy busy. Thursday I had a dinner after work, so I didn’t get my workout in until 8 o’clock. As it was a speed work session, I’d planned on doing it at the gym on the treadmill anyway. I really needed this run, emotionally, on Thursday night. I was already on edge from O’s school issues, then had a chaotic afternoon at work (that spilled over into me needing to come in on Friday several times on my “day off”, dragging O along since school was closed) and the straw that broke the camel’s back, not being able to call soon enough to tell O goodnight over the phone like I’d promised him. A tiny thing I know, but in a tough week, it had me near tears. It felt a lot better to pound that out on the treadmill. The workout called for a 10 minute warm up, followed by 6 1 minute speed intervals (I did 7 mph X 2, 7.3 mph, 7.5 mph, 7.7 mph, 8 mph X 2) with 2 minute recovery between and a 10 minute cool down to finish. I love the challenge of these speed and hill workouts! Friday Cross-training or 4 miles on the schedule, which ended up being 70 minutes of much needed yoga. I had over 10,000 steps for the day well before I had a chance to think about a workout, thanks to running around town back and forth to work, as well as trying to get some fun time with O in. I say this every time I dedicate more than 2 minutes to yoga but boy do I need to do this more often! Saturday Long run for the week was 7 miles and I tried out my new Ghost 7s. I think they’ll work out great – 7 miles with no foot pain or other issues, other than the tightness in my left leg that I’d noticed on Friday. It’s funny because it was warmer for this run than Tuesday’s 7 miler (later in the morning), so I felt like I was slower and I definitely took more walk breaks. My Garmin battery died at around mile 5 – I forgot to charge it after Tuesday’s run – so I was shocked to get home and find out that I finished this 7 miles about a minute faster than I did on Tuesday. When I’m running, I’m definitely running faster and that’s exciting, especially since my walk breaks seem to correlate with temperature more than anything else. I think my time goal for my half marathon is well within my reach if the weather cooperates in October!! Possibly the best part of my day Saturday was taking a nap with Oliver in the big bed. I started falling asleep before he did and he patted my cheek so sweetly before holding my hand while he fell asleep too. Such a heartbreakingly sweet kid, truly. Sunday Rest day on deck today, but if I don’t get some strength training done, I’ll be batting a big old ZERO for strength training this week. I’ve definitely got to get better about that! 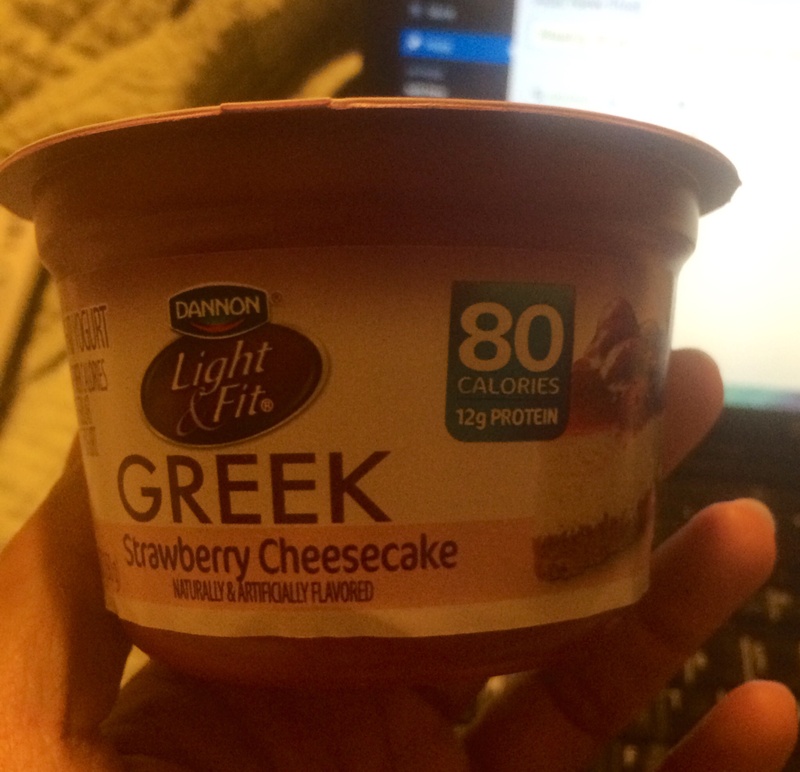 Yesterday I picked up a new flavor of the Light n Fit Greek yogurt. I loved the caramel macchiato I tried last week and grabbed strawberry cheesecake to test out as well. It tastes amazingly like Blue Bell Strawberry Cheesecake ice cream, which is actually a bad thing as that is an ice cream I have really vivid memories of binging on in the old days. Thus, I don’t think I’ll be buying this flavor again because it is making me feel inexplicably odd. I feel that ashamed, self-disgusted post-binge feeling even though it was just a cup of 80 calorie yogurt! Totally not worth it. Memory works in weird ways, doesn’t it? Strawberry Cheesecake – amazingly like Blue Bell’s strawberry cheesecake ice cream! I hope you all had a great week and have a restful Sunday! 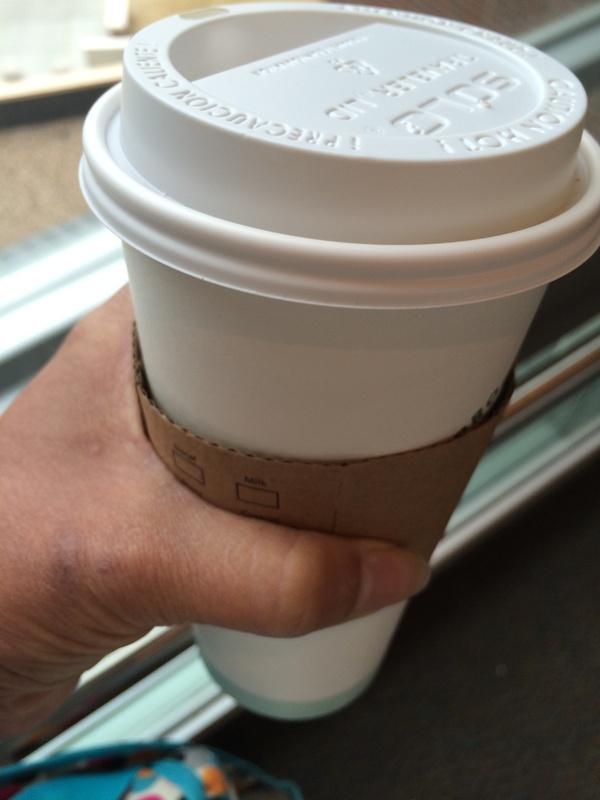 Coffee Date #5: Boy do I need that cup of coffee this morning! Today I might even splurge on something more frou frou than my usual brewed coffee. Yesterday was a crazy day! If we were having coffee this morning . . . I’d probably spend the first ten minutes running through my crazy Friday for you. Daycare was closed for a teacher in service day, so I’d planned ages ago to be off for the day. Thanks to a series of snafus that were no one’s fault, I ended up having to come in to cover something at work twice during the day, dragging O along with me, with a third visit in the middle to sort out some logistics. He was such a trooper but it was an exhausting day for both of us! Thank goodness for the dry erase board in my office, which kept him happily occupied while I worked. 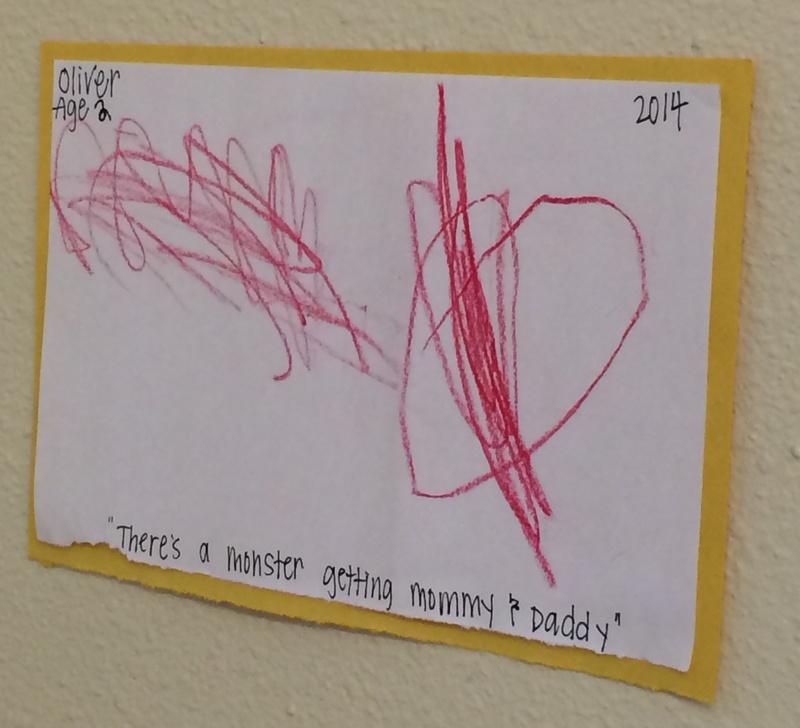 We did manage to get in at least a little of our original plan for our Mommy-Oliver day off, which we really needed after the stressful events of earlier this week. 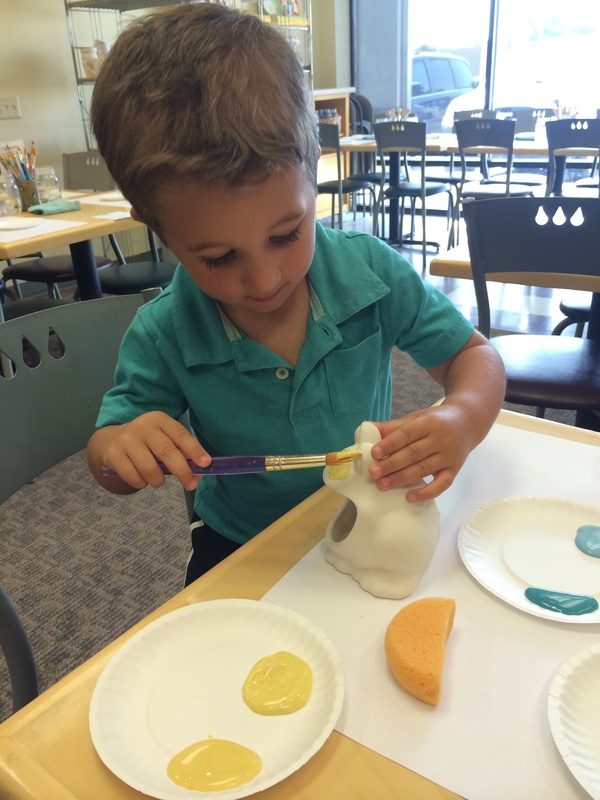 We went to a pottery store to paint some ceramics for my parents’ birthdays next month and had a lovely time together. 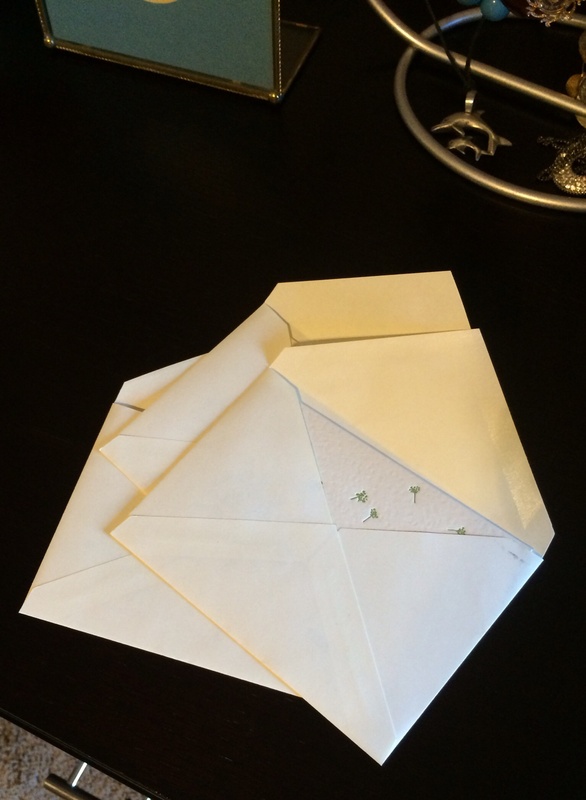 Unsent thank you cards – Whoops! Now I have the dilemma of whether to send them, 8 months late, or just toss them. I know there’s no such thing as too late for a thank you card, but I have this vague memory of having lost and rewritten thank you cards so I may have already taken care of this. Sigh. Life’s little etiquette dilemmas. Reminds me I should at least get my birthday thank you cards done this weekend. Here’s hoping I have a more relaxing day today than yesterday and the same for you guys as well! 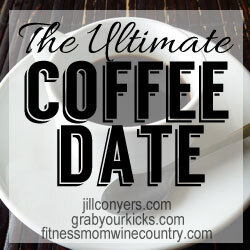 Thanks to Jill, Nikki and Lynda as always for hosting the Ultimate Coffee Date! July Goals: Is it really already July? 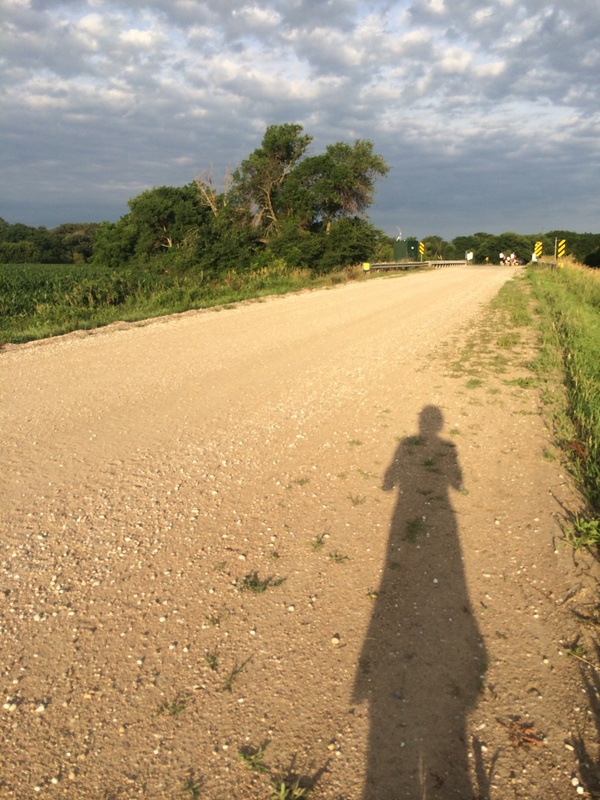 – Run 50 miles: I crossed this milestone Monday morning with my 3 mile run (first run of the new training plan!). I’m glad I took this on as it helped me feel a lot more ready for the training plan that is starting this week. – Strength training: Per usual, I was spotty with this goal. Over and over again, I tell myself I’ve got to strength train to be a safer and faster runner and to preserve muscle mass. Over and over again, I hit it one or two weeks out of the month and peter off. Sigh. One of my goals for this half marathon training cycle is to actually do the strength training. I have my husband roped in to do it with me, so hopefully that will help. – Run my 5K for the month in less than 33 minutes: Done! Unexpectedly, I might add given the soggy conditions. I’m feeling good about a real PR effort in the fall. – Get out of the 170 lb red zone: I’m not sure where I stand with this one. I was in the 160s most of the month, but then popped up at the end due to TOM so I think it is probably a wash overall. While I may or may not have convincingly met this goal, I can say I did stick to my plan of avoiding nighttime fruit snacking and increasing my exercise, so I’m happy with that overall. Whatever the scale was doing, I know I was making the right moves. That’s part of the reason I decided to try a new eating plan – I was having inexplicable scale swings doing the regular plan, so what’s the risk in trying something new, right? – Stick to the Simply Filling eating plan for one month: Yesterday I outlined why I’m making a shift and my plan for the next month. I’m going to work on learning when I’m really hungry, not just eating because I have the points. I’m also going to have to relearn what to order in restaurants! I know the points for a lot of restaurants that we frequent, but now I have to rethink things in terms of Power Foods. Still, a week in, we’re enjoying cooking a single meal for the whole family so this is a worthwhile experiment and I’ll just have to remind myself to be patient with the scale (so long as my clothes still fit!) for the duration of the experiment. – Join the National Weight Control Registry: Yep, one year of maintenance as of this week! – Do three simple yoga moves every night: I listened to a replay of one of my favorite Another Mother Runner podcasts this week, with Sage Rountree talking about yoga. She recommended 3 moves after runs: a deep squat, a sort of rotated IT band stretch that you do lying down and then my favorite, laying on the floor with your legs in the air! It’s only fitting that as I get a bit older this month, I make a goal to treat my joints a little kinder. – Make an appointment for my annual check-up: I’m pretty sure I’m overdue for this! Not being on daily medication anymore (yay! ), I lost track of this but still need to get a check up to be sure my blood pressure and blood sugar is still good. I’m also starting my half marathon training plan, so all of those goals are in play, and will be crossing Montana off of my “50 states” running list in a couple of weeks. Any tips on running at higher elevations? What are your goals for July? Can you believe it’s already here! Last night, I took advantage of a quiet night in the hotel to try out the new yoga DVD I ordered a few weeks ago. 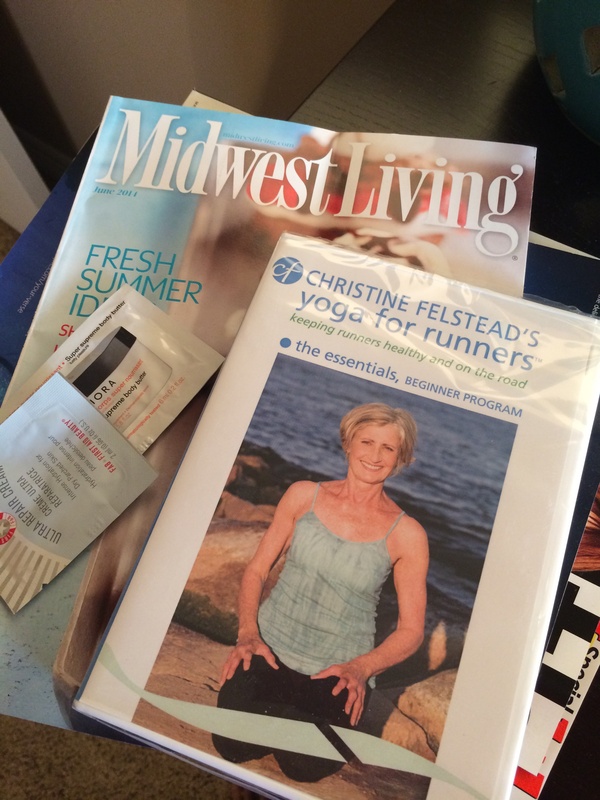 The DVD is Christine Felstead’s Yoga for Runners: The Essentials (that link is just to Amazon so you can see the details – not an affiliate link and this isn’t a sponsored post!) and overall, I’d recommend it for a runner looking to work some yoga into their routine, especially for a yoga beginner. Looking at the cover of the DVD points out the one complaint I had about the program actually. That smile on the cover is the only smile you’ll see! The entire DVD is populated with serious faced, black dressed people demonstrating the yoga moves. It’s a big of a downer, especially with the requisite yoga music in the background. Other than that particular quirk, I really enjoyed the DVD and thought it was very well done. The start screen menu has several chapters you can choose from: Introduction, Foundation, Hamstrings, Hips or Play all. It also advises that you watch the entire DVD first to familiarize yourself with the routine a bit before attempting it the first time. I would definitely agree with that recommend if you new to yoga. It helps a bit to know what you’re getting into! It starts with a brief introduction explaining Christine’s background as a runner and the specific needs of runners that yoga could address. This section lasted only 3-4 minutes. She explains that the people demonstrating the poses with her are runners and will be demonstrating some of the modifications you may need to make to accommodate the areas of tightness and imbalance we get from running sometimes. The “Foundation” section (20 minutes) walks through several very basic general yoga poses, like downward dog, child’s pose, mountain, etc. With each pose, she goes into a lot of detail about exactly what parts should be moving and where, to get into and out of the position. She also talks through modifications (some of which demo’d by the other runners) and prioritizes what part of the pose is the most important (for example, maintaining a straight back even if it means you can’t bend as much). 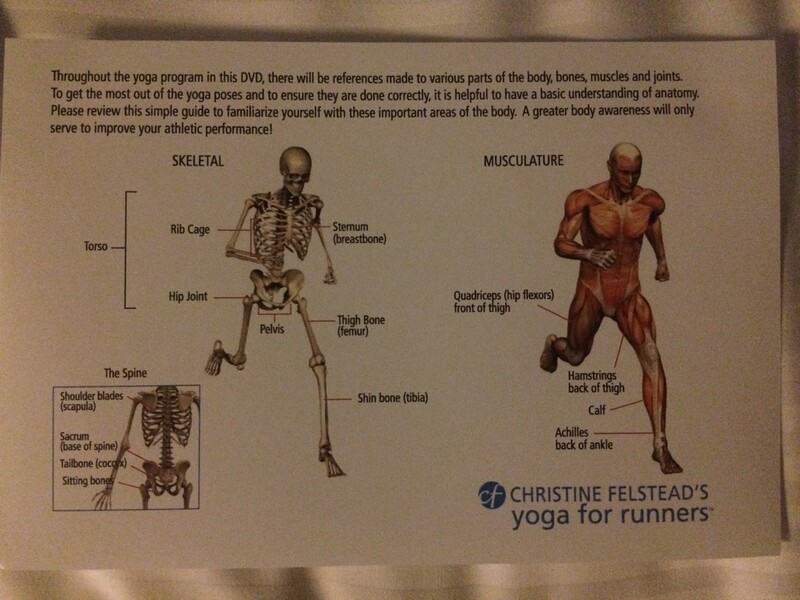 She explains the purpose of each pose, both as a general yoga practice and to highlight the specific needs of runners. In this section in particular, the talked about how to incorporate these “foundation” poses into every day life. If you’re new to yoga and just want to get your feet wet, start with just this section for a little while and you’ll get a decent stretch and some of the relaxation benefits of yoga. The “Hamstring” section (10 minutes) walks through simple stretches for calves and hamstrings. Again, lots of explanation for every step. The poses flow fairly quickly, with about 5 breaths spent in each pose so you definitely don’t get bored. I appreciate the time she takes to explain how to get in and out of the poses. The “Hips” section (15 minutes) included some of my favorite runner yoga poses, including pigeon pose and bound angle pose. My hips honestly feel so good after that I’ll forgive the lunges. I hate lunges. For some reason, I do not have the balance needed to make lunges work! Overall, it’s focused more on stretches and less on strength, which is again good for beginners I think and addresses the biggest reason most runners look to yoga in the first place. One other thing I really liked about this DVD is that it included a little flyer in the DVD case explaining the bone and muscle terms you’d hear, with a diagram so if you don’t know where your quads or hamstrings are, you have a reference. I’ve never seen that with a yoga DVD but I think it’s a great idea! I can do the moves without any extras, but they do go through how you would use yoga blocks, straps and/or towels/blankets to modify the movements. If you want ease into yoga to support your running practice, this would definitely be an approachable way to ease into it. Even as someone fairly familiar with yoga, I appreciated the explanation about how these moves specifically helped with runners, the routine itself efficiently targeted the issues I was interested in as a runner and I felt like it moved quickly enough to keep me from good bored. All in all, a nice little workout on Friday night to get me ready for today’s run. What are your favorite yoga DVDs? Do you prefer DVDs/streaming video classes or group classes with an actual instructor?